Got a rehearsal dinner to plan and need some easy—and economical—ideas for creating stunning tables? Just bring in candles, dress them up, and you can’t go wrong! Take inspiration from the glowing ideas below. All you need are some easy-to-find materials, and a choice of what thematic elements and/or colors to highlight as a way of creating your intended look. Whether it’s a formal, sit-down rehearsal dinner or a casual outdoor gathering with your entourage, try these candle decorating tips and craft a table that is both romantic and memorable. 1. Think 2 in 1 – Aim to use candles and candle decorations as both your lighting accessories and table centerpieces. This frees you from the traditional notion of floral centerpieces, while saving on the cost of fresh cut flowers. Hint: If possible, use decorations of varying heights, widths, and textures to create a sense of depth on your table such as using jeweled candle votive holders. As in the Moroccan table scene above, wrap large glass cylinders in translucent paper, finished with a band of gold foil. 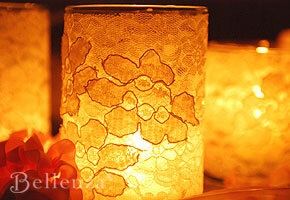 Line the center of your table with a row of these elegant luminaries, in place of the usual floral arrangement. Finally, add a lighted votive candle in each—and you’ve got that exotic, Moroccan-inspired look. 2. Remember, A Little Goes a Long Way – Understatement is often the best approach. Even just a few candles used as touches and accents immediately set the mood for your table. 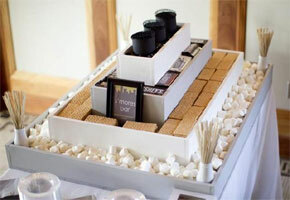 For instance, you’ll be surprised at how versatile white candles can be. Simply stand them on pretty mirrored plates as seen above, then either group them at the table’s center or position them at random amidst the table display. Instant elegance! 3. Use Basic, Yet Versatile Materials – Source easy-to-find materials in various textures, colors, and styles. For example, natural-colored raffia or straw brings a great tropical vibe to a summer wedding table—as in our example above where different-sized glass cylinders are wrapped with raffia. The same material can also create a charming rustic look for a Tuscan-inspired or even an Easter-time table display. 4. Choose Recyclable Accessories – Select lighting accessories that are reusable. The cylindrical glass vases in our examples, for instance, may serve as exotic luminaries at one event, then as “hurricane lantern” candle holders (see above) at another. The trick is to have them plain and simple enough to be dressed up in almost limitless ways. 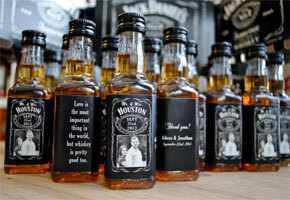 Then, set them out in varied sizes to add visual interest to your table. Hint: Because of their versatility, you can use decor pieces like these for different purposes in future events you may host as a couple! 5. Create Unusual Arrangements – How you arrange your candles is just as important as how they look! A creative configuration can actually make even the simplest candles look quite stunning with very little effort. Notice that the candle decorations are artfully arranged in a zig-zag or “S”-like fashion (see above). Now, let’s see more of these candlelight ideas in action. Our example is a setting for an intimate rehearsal dinner where guests are made to feel like they’re dining in a romantic French chateau. We’ve incorporated some frills and lace to infuse that tres-chic look, while candles of different sizes are used throughout the table setting. Take a look! A beautiful, candlelit table is adorned with elegant details such as gold leaf frames, fragrant rose petals, and a variety of candle decorations that all evoke a romantic flair. You’ll get a similar effect—maybe not as frilly, but just as romantic! The picture of the table setting inspired by a French chateau is so romantic. 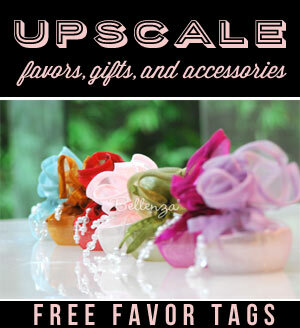 It’s such an original idea for table decor with the ruffled ribbons! Was surprised to see the organza circles used as placemats. I’d seen these used as favor wraps in other Bellenza features. It turns out, they’re so versatile!